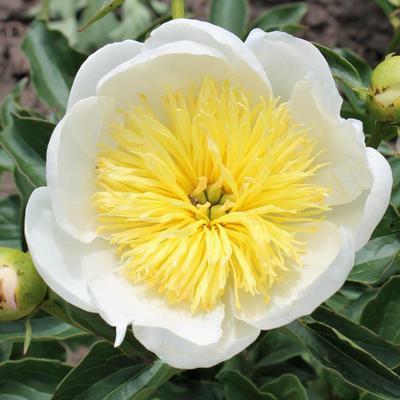 Japanese form, dense white petals surround the prominent center of bright, light yellow and narrow staminodes. The flowers open Mid-late to Late season, the flowering period extended by side-buds. Plant habit is outstanding, combining strong stems and season long retention of foliage quality. The leaflets remain green and healthy into late summer, remaining viable in our lower Midwest climate stress and showing strong resistance to both the common peony leafspot fungi and to the peony mildew which has spread across the North American continent during recent years. 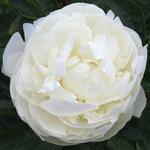 This is a peony which can take on the more demanding role of mass planting in a designed landscape. For, it needs no screening after flowering, holding its own with the more structural ornamental choices, making a season-long positive contribution. Species cultivar, P. lactiflora. Parentage: 'Jan Van Leuwen' x [pollen parent unknown]. Seed fertile. Cultivar appears to be resistant to common leafspot fungi and powdery mildew. Seedling N� 2852. Seed parent 'Jan van Leuwen', pollen parent unknown. 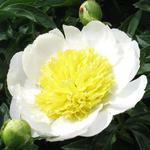 JAPANESE flower form, dense white petals surround the prominent center of bright, light yellow and narrow staminodes. The 5-inch (13 cm) flowers open Mid-late to Late season, the flowering period extended by side-buds. Plant habit is outstanding, combining strong stems and season long retention of foliage quality. Height at maturity 30-34 inches (76-86 cm). 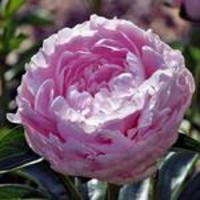 The leaflets remain green and healthy into late summer, remaining viable in our lower Midwest climate stress and showing strong resistance to both the common peony leafspot fungi and to the peony mildew which has spread across the North American continent during recent years. 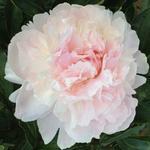 This is a peony which can take on the more demanding role of mass planting in a designed landscape. It needs no screening after flowering, holding its own with the more structural ornamental choices, making a season-long positive contribution. Seed fertile. To be introduced in commerce by J. Steininger.